​Wild places sustain and define us;​we, in turn, must protect them. We Saved Climax and Little Egypt! As you may have heard by now, the Forest Service has agreed to withdraw the Crooked Creek Project, and to not log or use herbicides in Climax, Little Egypt, or the several other parcels of the Daniel Boone included in the project. The Forest Service has indicated that they are still interested in non-commercial thinning of the old clearcuts, something which we strongly support. So far they have not committed to the Little Egypt Trail, and so we will continue to work to see that vision come to fruition. This accomplishment was only possible because of the contributions of the many people who stepped up and spoke out to see these beautiful forests protected. Special thanks go out to Chris Smith, Melanie Abbott, Lynn Tatum, and Rockcastle County Judge Executive Buzz Carloftis, all of whom helped the Forest Service to understand that the value of these forests to the community was not in board feet, but in their absolute beauty and the testament that they provide to the rich natural history of Rockcastle County. And without our members and donors, Kentucky Heartwood would not have been here throughout this effort to see it through. We're a small organization, and every dollar really does help. Please join or donate to Kentucky Heartwood, and be part of our efforts to protect Kentucky's wild forests. This triple waterfall drops straight into an underground cave. In August 2010, the US Forest Service proposed the Crooked Creek Vegetation Management Project. This project proposed to commercially log 365 acres of the Daniel Boone National Forest on the hills above Climax Spring and Salamander Springs Farm and other national forest lands about 1.5 miles west of the Great Saltpetre Cave. The proposal included the construction of “temporary” roads and the use of herbicide to kill both native trees considered undesirable by the Forest Service and invasive species that will likely colonize the logged areas. 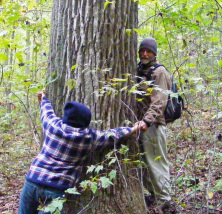 Kentucky Heartwood acted quickly to inform local citizens in Rockcastle and southern Madison counties about the proposal, and began field work to determine the health and age of the forest blocks proposed for cutting. Early community organizing efforts centered around protecting the quality of a well known community and commercial water source that recharges in the northern portion of the project area - Climax Spring. Based on the name recognition of Climax Spring, we organized well-attended meetings with concerned local citizens in Mt. Vernon and with the Berea chapter of Kentuckians for the Commonwealth (KFTC). These meetings resulted in a growing and informed opposition to the extensive logging and herbicide use proposed by the Forest Service. The Crooked Creek Vegetation Management Project was proposed in an area with very little public land and substantial logging, quarrying, and other uses impacting private land. The Forest Service already clearcut significant portions of the area 20 years ago, and barely half of the national forest in the project area is more than 70 years in age - in a forest where trees can live to be several hundred years old. The area has numerous springs, several species of orchids, and is just beginning to reach maturity. 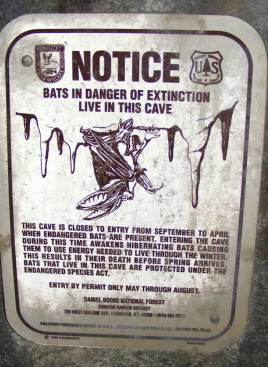 In several locations waterfalls drop into collapsed cave systems in the underlying limestone karst and emerge further down the valley, while deep caves offer refuge to endangered Rafinesque’s Big-eared bats. The Forest Service insisted that the combined 646 acres of commercial and precommercial thinning was necessary to alleviate overstocking. However they proposed cutting nearly all trees on 93 acres – recreating the very same conditions they said they must manage to “fix.” At the same time, natural disturbance in the forest is creating a diverse mosaic of habitats in the project area. About 6 miles south of Climax, field work in the southern section of the project area has proven that the Forest Service's plans for logging this section of the Daniel Boone are reckless and ill-conceived. The USFS has inventoried the forest in the area known as Little Egypt as less than 100 years old and characterized it as in need of "thinning" to promote the growth of "desired species." Here "thinning" means cutting up to 90% of the trees in some areas and "desired species" means commercially desired species. Our own inventories have found extensive mature forest. Some areas that were proposed for logging are as old as 150 years. The forests here are healthy, diverse, and in some places are developing old-growth characteristics. This shortleaf pine is the 3rd oldest of its kind - over 300 years old! Of special significance is a shortleaf pine that is over 300 years old. It is the third oldest documented tree of its species, and is in an area where the Forest Service proposed to cut much of the forest. As an alternative to logging the area, we proposed that the Forest Service develop a hiking and equestrian trail system that promotes the cultural and natural history of Rockcastle County. Click here to learn more about the Little Egypt Heritage Trail proposal. Please contact us if you are interested in endorsing the Little Egypt Heritage Trail Project.